CLEVELAND -- For the second time this postseason, the Cleveland Cavaliers will experience the two greatest words in sports: Game 7. With a 109-99 win over the Boston Celtics in Game 6 of the Eastern Conference Finals on Friday night, the Cavs forced just that and will now face the Celtics in a winner-takes-all game in Boston on Sunday. With a win, Cleveland will advance to a fourth straight NBA Finals. With a loss, the Cavs' season will come to an end. With the Cavs facing elimination on Friday night, LeBron James turned in a masterful 46-point, 11-rebound, 9-assist performance, while point guard George Hill added 20 points. Guard Terry Rozier led Boston with 28 points and Jaylen Brown scored 27. What follows is a running recap of the Cavs' Game 6 victory, complete with highlight and analysis. 1:40: Cavs 107, Celtics 96: Back to back 3s from LeBron James to extend the Cavs' lead back to 11. That should do it. 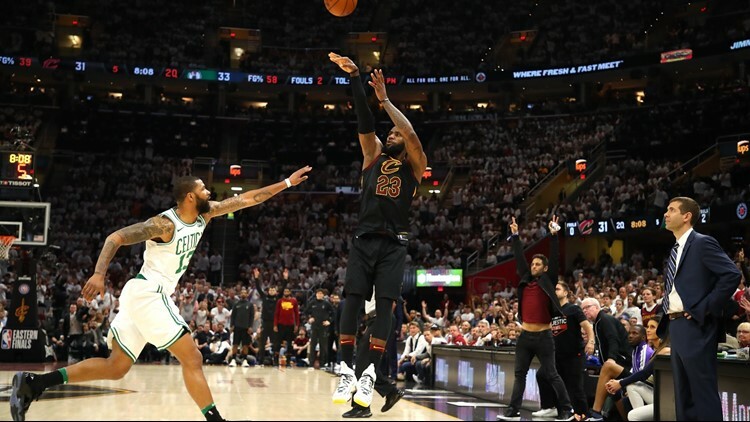 3:54: Cavs 97, Celtics 90: LeBron with 38, 11 rebounds and 7 assists and George Hill up to 20 for the Cavs, who are clinging to a seven-point lead in the final four minutes. 6:32: Cavs 95, Celtics 83: Boston had trimmed the Cavs' lead to seven, but a LeBron James putback pushes it back to 12. Timeout Boston. End of quarter: Cavs 83, Celtics 73: Kyle Korver and Terry Rozier trade 3-point shots as the Cavs take a 10-point lead into the fourth quarter. 2:12: Cavs 80, Celtics 65: A Jeff Green 3 stretches the Cavs' lead to 15 and forces a Celtics timeout. LeBron up to 32, 7 and 7 and 0 minutes of rest. 7:18: Cavs 65, Celtics 52: LeBron makes a layup and swats a Terry Rozier 3 back to Shaker Heights as the Cavs come out in the third quarter with some energy. UPDATE: Kevin Love is being held out for the remainder of the game as he continues to be evaluated for a possible concussion. Halftime: Cavs 54, Celtics 43: A Terry Rozier cuts what was a 14-point Cavs lead to 11 heading into halftime. 25 first-half points for LeBron. Still no word on Kevin Love. 2:06: Cavs 49, Celtics 38: Cavs' run wound ending at 20-4, but they still wind up holding onto an 11-points advantage. LeBron up to 20 points already and has yet to rest. 4:59: Cavs 38, Celtics 34: Cavs push their lead to double-digits as a Jordan Clarkson fast-break layup extends a 15-1 run. 6:29: Cavs 38, Celtics 33: Cavs coming alive and getting some good contributions off the bench from Jeff Green (7) points and Larry Nance Jr. (4 points). Still no word on Kevin Love. End of quarter: Celtics 25, Cavs 20: Celtics take a five-point lead into the second quarter thanks in large part to 15 first-quarter points from Jaylen Brown. 3:44: Celtics 14, Cavs 13: Boston jumps out to an early lead over the Cavs, who are now without Kevin Love due to a collision with Jayson Tatum. Love being checked on in the locker room now. Live Stream the Cavaliers playoff game - Try fuboTV - Free Trial today!